One of my favorite things about having a baby was telling her how much she meant to me. I’d whisper mushy sentiments to her over and over. How could I not, what with those tiny toes, button nose and scrumptious smile? I also read books to her that expressed similar sentiments. Even if she didn’t understand the meaning of what I was saying, the gentle words of the stories were soothing, and the pictures of babies and toddlers were fun to explore. Maybe it was all those new-mom hormones, but whenever I saw a book that talked about a mother’s love and the preciousness of a baby, I was helpless. I’d borrow several books at a time from the library, and when I spotted an especially lovey-dovey book at the bookstore, if I could, I’d splurge. Looking back, it wasn’t such a bad habit! Short, upbeat, baby-friendly sentences punctuate this board book that doubles as a photo album. One page reads: “Baby polar bear likes to be held.” The facing page says: “I like being held, too!” and includes a space for a 5×7 photograph. 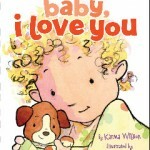 Moms will enjoy placing photos in this book and babies will love seeing themselves! From eating healthy foods to painting the nursery, warm words in English and Spanish show youngsters just what mom and dad did as they prepared for their new baby: “Before you were here, tu papi carved a mecedora from the wood of an old walnut tree so you and I could rock together.” Bright and colorful watercolors complement the text. An English/Spanish glossary of 70-plus words appears at the back of the book. Mia Geiger is a freelancer is the Philadelphia area.